Snow day? Here in Southern California we can only dream of having a snow day. But we had a great time on a recent rainy day making these “Snow Day” gluten-free cookies. They’re easy, they take surprisingly few ingredients, and they are so irresistibly delicious you might just spend your whole “indoor” day eating them up. 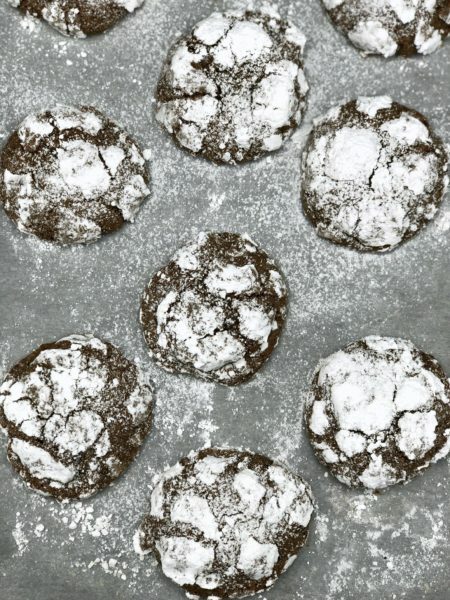 We adapted these cookies from the Snowy-Topped Brownie Drops from Dorie Greenspan in one of our favorite books, Dorie’s Cookies. We swapped out the all-purpose flour for a gluten-free flour, and we just used chocolate chips because we’re more likely to have them on hand (which is especially important on a snowy or rainy day when you don’t feel like running out to the store). 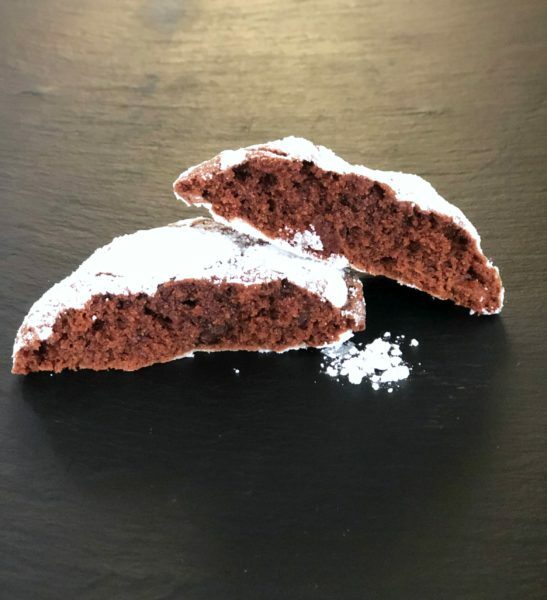 These irresistible chocolate gluten-free cookies are coated with a sprinkling of powdered sugar. 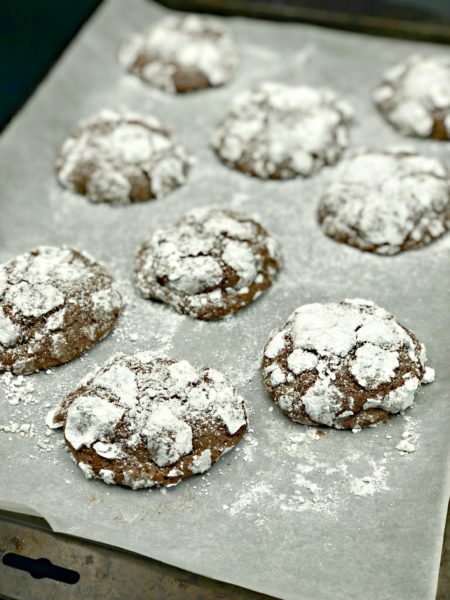 They're adapted from Dorie Greenspan's Snowy-Topped Brownie Drops in "Dorie's Cookies." Using a double boiler (or a heatproof bowl over a pot of boiling water), heat the butter and the 1 cup of chocolate chips until just melted and combined into a smooth and glossy texture. Remove from heat. Whisk sugar into the chocolate/butter mixture. Add the eggs one at a time, whisking after each addition. Add the vanilla and salt, continuing to mix, and then stir in the flour. Stir in the 1/4 cup of chocolate chips. Cover the bowl and chill the dough for at least three hours. Remove the dough from the refrigerator. Using a cookie scoop or tablespoon, scoop out small round balls of dough. Drop the dough balls into the powdered sugar and roll around to coat. Arrange the powdered sugar-coated dough balls on a parchment paper-lined cookie sheet at least two inches apart. Bake at 350 degrees for 15 minutes, or until cookies have spread and have a light crispy crust on the top. Cool cookies on a wire rack. And that’s it! Done and done. Even if you don’t eat gluten-free, you’ll enjoy these gluten-free cookies as much as any traditional cookies. Warning: They won’t last long. P.S. Need other gluten-free desserts? Check out this Raw Chocolate and Cherry Mousse Tart, this Clean Snax Holiday Apple-Cranberry Crisp, or this Vegan Gluten-Free Chocolate Cake (made in a pressure cooker! ).